It is a subject that is not much spoken about in scientific meetings. But breaking from the tradition of academic societies, the Astronomical Society of India (ASI) has taken a bold step by putting gender bias on its agenda. The Working Group on Gender Equity (WGGE), established by the association two years ago, presented results of its first survey on gender equity in the field of astronomy in India, at the ongoing session of ASI here. The survey, for the first time, acknowledges the presence of gender bias in Indian research and academic institutions engaged in teaching and research of astronomy and astrophysics. This is reflected in both the small numbers of women scientists and researchers in the institutes, as well as the perceptions gathered in the survey. 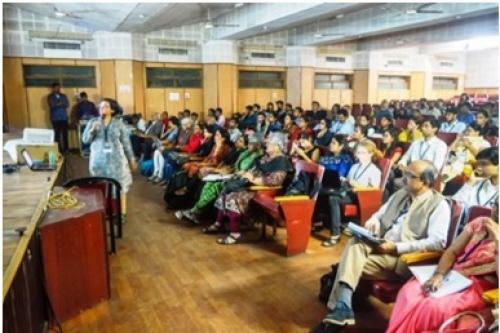 The survey has revealed that 30 per cent of both male and female student respondents believe there is gender-based discrimination in astronomy in India. Among faculty members and researchers who participated, 60 per cent of male participants believed that there is gender discrimination while 80 per cent of women felt there was discrimination. At the faculty level, Indian Institute of Astrophysics and National Centre for Radio Astronomy of TIFR had between 21 to 23 percent women, while th­­e number was larger at the student level. The Indian Institute of Science, Bangalore performed poorly with just one female faculty out of six in the astrophysics department, and just two of 18 students are women in 2017. Only 40 percent of women astronomers surveyed were aware about mechanisms like Internal Complaints Committee. Overall, only 12 percent of faculty positions in Indian astronomical and astrophysics institutes are occupied by women, although their number is considerably higher at postdoc (30 per cent) and PhD (32 per cent) levels. “This only means that we are losing trained talent,” pointed out Preeti Kharb, a scientist at the National Centre for Radio Astrophysics–TIFR, and a member of the working group. However, universities seem to be doing a job better in hiring female faculty members (up to 20 per cent) compared to research institutes (10 per cent). “Gender-balance will not be achieved as long as the fraction of women in a given level of advancement is smaller than the fraction in the total pool. It is also necessary that gender-related data must be gathered, monitored and used to identify—and address—problems,” said Kharb. In addition, she said, gender-sensitization talks and meetings should be organised to enhance awareness about the issue at all levels. Several senior scientists, mid-career researchers and students, who spoke at the meeting, expressed concern over discrimination and offered suggestions. “It is important that scientific and astronomy community transforms itself into a more open, inclusive, and diverse one, truly representative of our population. The WGGE set up by the ASI is crucial in this struggle to make astronomy gender equitable. The objective is to involve men, women and transgender astronomers together,” commented Niruj Mohan Ramanujam, a member of the working group. Globally, there is renewed interest about the presence of women in science, particularly mathematics and physics. Prajval Shastri, a member of the Global Gender Gap Project of the International Union for Science said that existing data on participation of women in mathematical and natural sciences was scattered and inconsistent over research areas. The project is aimed at generating evidence to support decision making.